This book provides a skilled and knowledgeable exploration into to the uses of 7 herbs by a master herbalist. This book would be useful to students and practioners of herbalism, homeopathy, and flower essences, as the information can be utilized across these disciplines. The book clearly explains when and how to use these remedies and gives ample case studies from author's personal experience that further assist the reader in forming a clear picture of the signature of the herbs described. Matthew Wood is a registered herbalist with the American Herbalists Guild, and has maintained a private practice as an herbalist for twenty years. He lives and practices at Sunnyfield Herb Farm in Minnetrista, Minnesota. "In fine inspired prose Matthew Wood teaches us the personalities of seven common herbs and the corresponding human personalities for which they provide benefit. 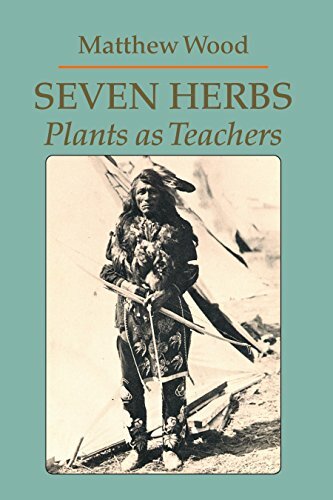 Seven Hearbs: Plants as Teachers synthesizes insights from the teachings of Paracelsus, the science of homeopathic medicine, and the stories of the Bible to help us understand how the nature that surrounds us teaches and heals us. After reading this book, you will find it more difficult than ever to seperate the science, art, and spirit of healing." "Matthew Wood in his book has succeeded in integrating information in a manner which is rarely seen in contemporary writing. Starting with the works of Bohm, Paracelsus, Hahnemann, Burnett, and Bach, he has studied long and hard and has created a work that is far greater than the sum of its parts. This book belongs in the library of healers of all persuasions."